Once you taste homemade vegetable stock compared to the store-bought version, you’ll understand why making it yourself – while also super easy and inexpensive – is the way to go. 1. Roast the vegetables. 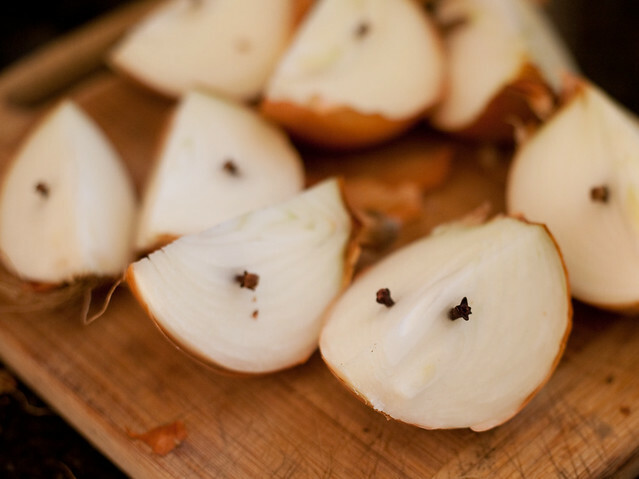 Doubling this recipe from the Kitchn, I started with onions cut into quarters and pierced with whole cloves. 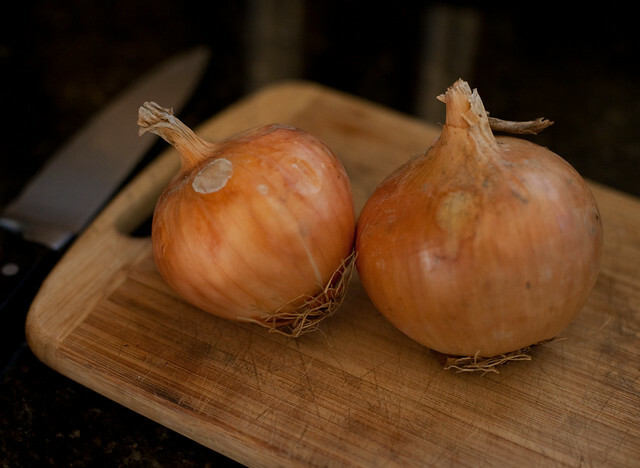 I left the onion skins on to give the stock a warm color – it’s okay to leave the skin on, since you’ll be straining the liquid in the end. As well as whole garlic cloves, carrots cut in big chunks, and leeks. I then drizzled canola oil over the vegetables. I normally roast vegetables in olive oil, but the Kitchn recipe recommends using a neutral oil. I roasted the vegetables for 45 minutes, giving them a stir a few times, while checking to make sure nothing was burning. With roasting, I read, you want everything to caramelize but not to burn. 2. Deglaze the pans. After the vegetables were done roasting, I moved them to a large soup pot and then placed the roasting pans right on the burners. I added about a cup of red wine to each pan (white is also an option) and then let the wine come to a simmer so I could scrape the roasted bits off the pan, also called deglazing. 3. Simmer the vegetables. I added the deglazed vegetable bits and wine with 12 cups of water to the pan (again, doubling the recipe) and threw in some bay leaves and peppercorns. This is when you can add any herbs, preferably fresh, like parsley, thyme or rosemary. I simmered the vegetables for about 45 minutes, which also cooks off the alcohol. 4. Strain the stock. As the final step, I strained the stock through cheese cloth and squeezed out the juice with my hands. After letting the stock cool, I transferred it to containers to freeze. The remaining vegetable bits went straight into the compost. When setting out to make any kind of vegetable soup, pilaf, poached fish, or casserole, we can now defrost a cup or two of our homemade stock to use as the neutral base and go from there. Here is the complete recipe taken that I followed (doubled) taken from the Kitchn. Preheat oven to 400 degrees. 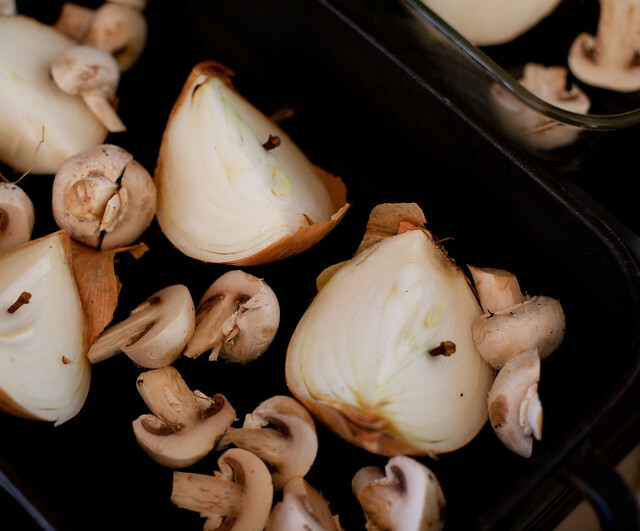 Place the onion, mushrooms, tomatoes, carrot and garlic, and any other vegetables, in a roasting pan. Drizzle with the oil and toss to coat the vegetables. Place in the oven, uncovered, and roast for about 45 minutes, stirring occasionally. Watch the vegetables so they don’t char (the leek greens will be especially vulnerable). You are looking for browning and caramelization, not burnt. 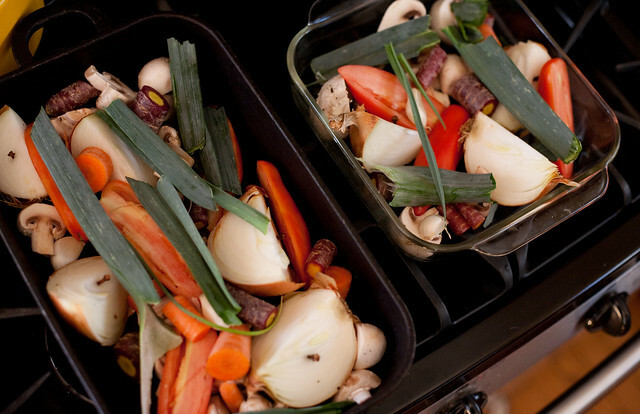 If some of the vegetables start to char before the others are done, remove them from the roasting pan. 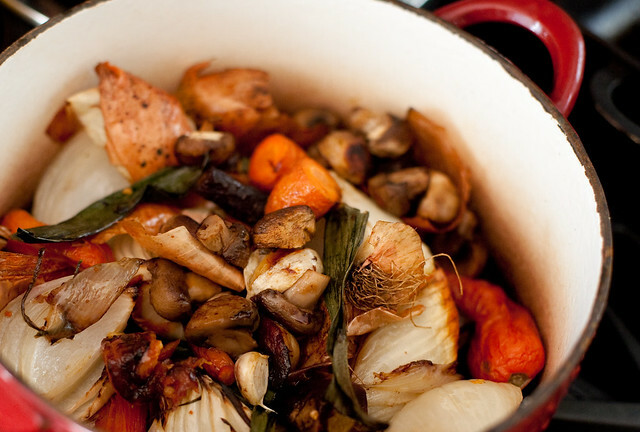 When the vegetables are done, remove from oven and scrape into a 4-quart sauce pan or Dutch oven. 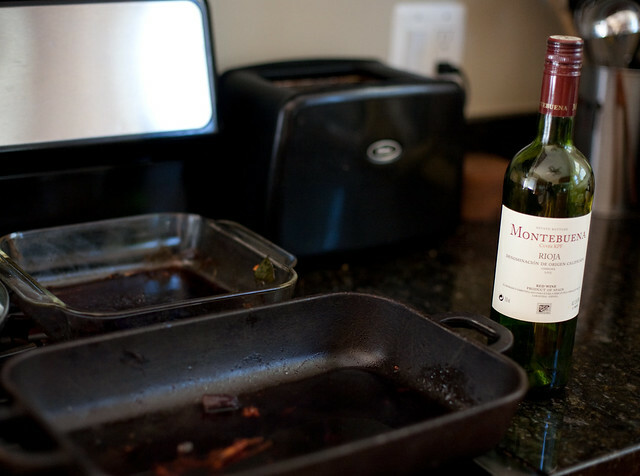 Place the roasting pan over a burner (or two, depending on the size of your pan) and add the wine. Bring to a simmer and deglaze the pan, scraping up any stuck bits. Empty the contents of the roasting pan into the pot with the vegetables and add 6 cups of water, the bay leaves and peppercorns. Bring to a simmer and cook gently for about 1/2 hour or so. 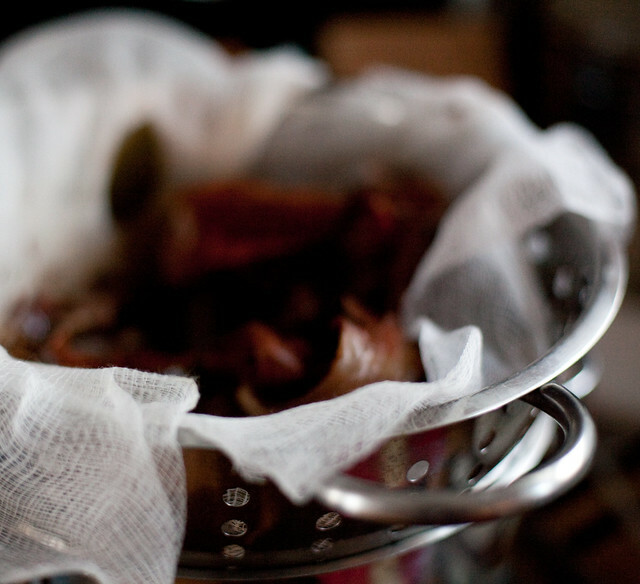 Strain through a cheesecloth-lined sieve and use as needed. 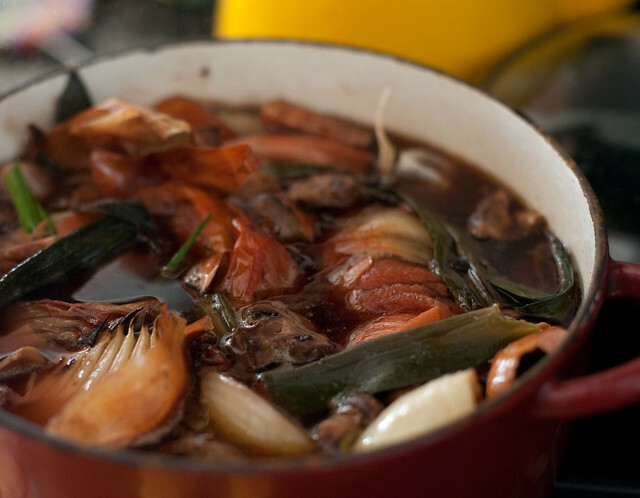 A good vegetable broth source for organic vegetables is MOM’s Organic Market “compost”. The produce manager culls imperfect vegetables from the sales floor and tosses them in a box that is made available for free to shoppers as “compost”. It’s like a farm share: a wide variety of leafy greens, imperfect root vegetables, fruits. 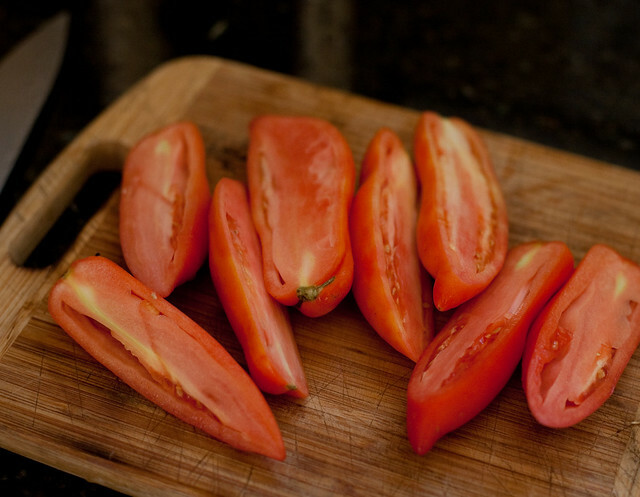 It’s a great source of diverse veggies that you won’t feel guilty tossing on the compost pile after roasting and boiling down for broth….which ends up like a rich tea, different every time. What a great tip, Margaret! I’ll definitely take advantage of this.